Heywood and Middleton Voters Backing Ukip Doing So Because They "Like Their Policies"
Latest polling for the Heywood and Middleton by-election shows that the majority of those planning to vote Ukip are doing so because they like the party’s policies. 14 percent were planning to vote tactically to prevent another party getting in, and just 8 percent of those polled planned on voting Ukip as a protest vote. The polling, undertaken by Survation, shows Labour in the lead to win the seat whilst Ukip are current in second place on nearly 31 percent – up 28 points. Meanwhile, the Conservatives, who came second in the constituency in 2010 with 27 percent of the vote, have slipped to just 12 percent. The Liberal Democrats are on track to lose their deposit, with just 3.7 percent backing their candidate. Other than voting intention, Survation asked why people were intending to vote as they planned, offering a range of reasons including “I like the candidate” and “I like their policies specifically on the economy”. The most popular response from Ukip supporters was “I like their policies generally”, which nearly 30 percent agreed with. Overwhelmingly the most popular response from Labour supporters was “Always voted for them (tribal loyalty)”, with over 61 percent agreeing with that statement. Just 15 percent of Labour supporters were voting for them because they like the party’s policies. Conservative supporters were also mainly voting for the party for reasons of tribal loyalty, with more 32 percent of percent of their supporters choosing that option. 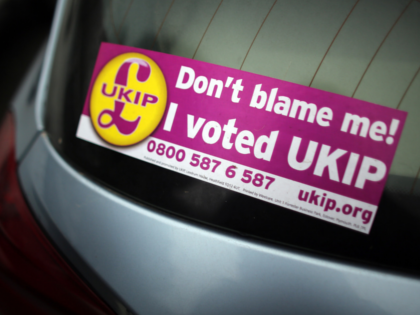 Labour are becoming increasingly nervous of a Ukip insurgency in their constituencies. Yesterday Breitbart London reported on a new piece of research by The Fabian Society, in which the threat that Ukip pose to Labour, both directly and indirectly was highlighted. The report, authored by Marcus Roberts, who was Field Director for Ed Miliband’s leadership campaign, identifies five seats that Ukip could take from Labour at the next general election, and a further 16 that may fall to the Conservatives thanks to Ukip hindering Labour’s vote. Yesterday a Muslim British-Pakistani councillor in London was appointed chair of the Ealing Ukip branch. Local news outlet GetWestLondon has reported that Afzal Akram is a former Labour councillor who defected to Ukip three months ago after becoming “disenchanted” with Labour. “What enticed me to UKIP was that they are willing to listen,” he said, adding “People have said to me ‘it’s a racist party why are you joining’. The Haywood and Middleton by-election is due to take place this coming Thursday.